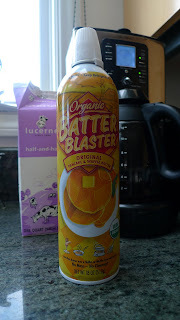 siriously delicious: Giveaway: 5 Cans of Batter Blaster! Giveaway: 5 Cans of Batter Blaster! I've decided life is too short to not eat chocolate chip pancakes in the morning. ESPECIALLY when you have an organic can of Batter Blaster in your fridge at the ready! Scrumptious. WHO WANTS FIVE CANS??? I'm giving away FIVE cans, thanks to the lovely people at Batter Blaster. 1. You must be an official follower of this blog to win (please click the "follow" icon in right margin). 2. Only open to residents of the U.S. and Canada. 3. Winner will be chosen at random on Wednesday, November 10th, at 10am PT. Pancakes in a can? That's almost as good as a tube of kittens! My kids love Batter Blaster!!!! I've seen this and have been curious about it, but never brave enough to try it.... Crossing my fingers that my lucky number comes up for this giveaway! My kids are getting up earlier too! NO BUENO. Love pancakes and waffles? CHECK! Would love to make them quicker? CHECK! I had the microwavable kind this am for breakfast and was thinking don't think it can get much better than this... then along came your blog post! Where do you find it??? YES!, I'll eat anything in a can!